This song explores frustration with a lack of meaningful progress despite one’s best efforts. But it manages an almost-optimistic feel to it somehow through all of that. It’s also the ninth track on my new solo album, Blue Skies Black. Why is it called “Florida”? The music for it was written at my great aunt and uncle’s house in Florida, many years ago. Drums on this song performed by Melanie Krahmer from Sirsy; all other parts performed and written by me. “Everything’s Fine” is a simple song trying to remind myself that today is just as important as the future. It’s the sixth track on my new solo album, Blue Skies Black. I had some fun with the slide guitars on this one. Drums on this song performed by the one and only John Brodeur; all other parts performed and written by yours truly. If you like the tune, please consider buying the song/album and please tell your friends about it! Need some new music? 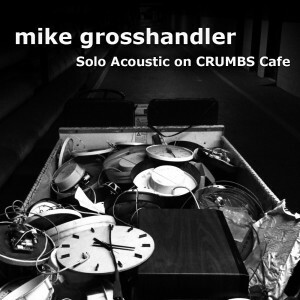 Check out these two solo acoustic tracks from my interview with CRUMBS Cafe (www.crumbs.net)! “So Long” is a brand new song, never before released, while “Without You” is a stripped-down arrangement of the final track from Blue Skies Black. A great new review of Blue Skies Black is up on Paragon Music Magazine! Come on out this Sunday afternoon (11/18) and support the grand opening of The Cheese Traveler, a brand new local business, and hear some free live music including yours truly! I hit the stage at 4pm doing a solo acoustic set of tunes from Blue Skies Black as well as some Velmas and older solo material. Cheese and music – you can’t go wrong! Click the album cover for more info!